Can you spot the difference between the two pictures above? One is the level of demolition proposed in British Land’s previous scheme for Norton Folgate and one is their recently revised version. 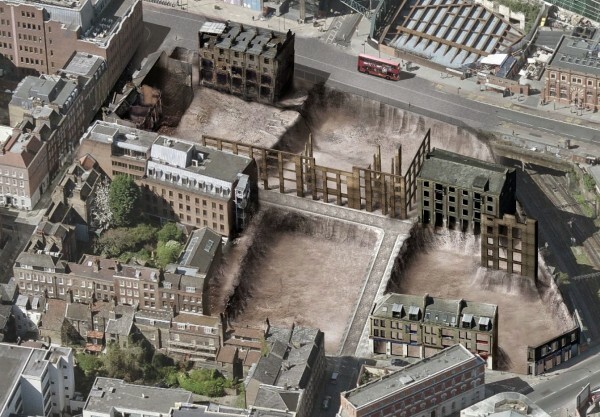 When Spitalfields Trust challenged this destruction of the warehouses, British Land claimed they were preserving them – which makes it paradoxical that now British Land have announced they are ‘retaining’ the warehouses as a concession to those who objected to their scheme. 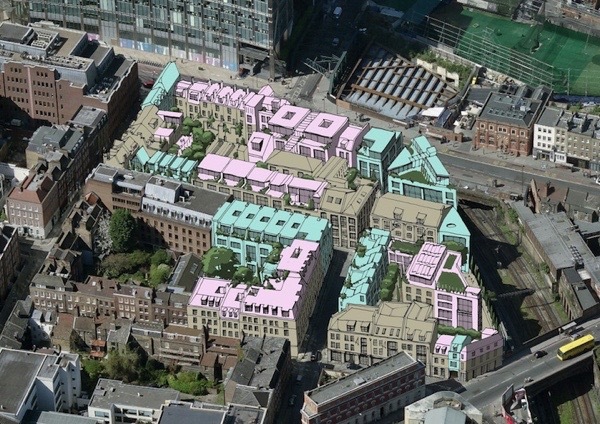 Boris Johnson, Mayor of London has ‘called in’ the British Land Norton Folgate scheme which was rejected unanimously by Tower Hamlets Strategic Development Committee in July. On 18th January, the Mayor will stage a public hearing at City Hall at which he will determine the decision upon the application himself. This will be the thirteenth such ‘call in’ and the previous twelve have all been determined in favour of the developer. Meanwhile, the Spitalfields Trust have launched a Judicial Review into the legitimacy of the ‘call in’ and billionaire Troels Povlson has offered to buy the site so that the Trust may implement their alternative scheme by Burrell Foley Fisher, which is based upon the principal of minimal architectural intervention, utilising Norton Folgate to serve the needs of local people by providing genuinely affordable workspaces and housing. 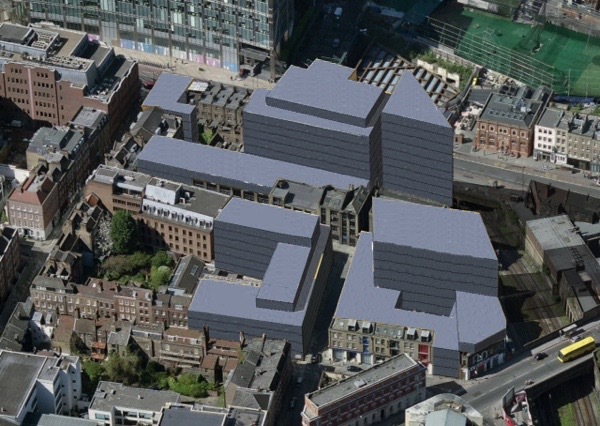 British Land’s amended proposal for Norton Folgate is still an overblown development that will destroy an historic neighbourhood to replace it with a hideous corporate plaza. We need you to help us stop this, by writing letters of objection to point out that it remains unacceptable. You will find a simple guide to how to object below. This is a simple guide to how to write to the Greater London Authority objecting to British Land’s amended scheme for Norton Folgate. Your email or letter needs to arrive before 14th December. 1. 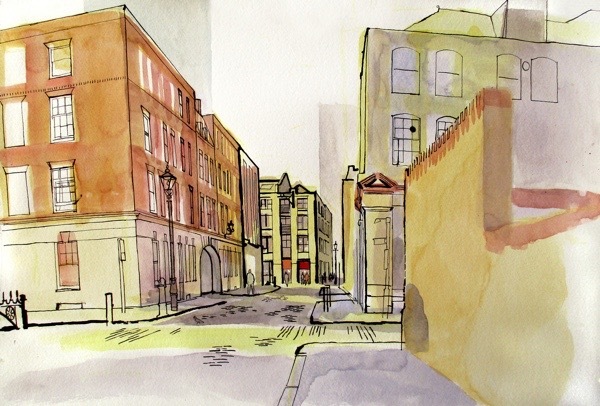 Tower Hamlets Council refused the application unanimously on three grounds – harm to the character and appearance of the Conservation Area, the low level of housing and the low level of Affordable Housing. These objections still stand. 2. The amendments, although welcome, are very small in comparison with the overall scale of the development. 3. The level of destruction within this important Conservation Area is still huge. 4. The historic layout of courtyards and lanes, the fine grain of the area, will still be destroyed. 5. Our original objection to the scheme criticised the treatment of a dozen buildings, of which this amendment addresses only one. For instance, the two eighteenth-century buildings still standing on Norton Folgate itself are being removed – number 14 in its entirety and all of number 15 except its front elevation. Numbers 16-19 Norton Folgate will still have the ground floor hollowed out to provide a passage entrance way to the new development. 6. Just as originally proposed, the scheme remains an overblown megastructure with large office floor plates, still rising to as many as fourteen storeys. 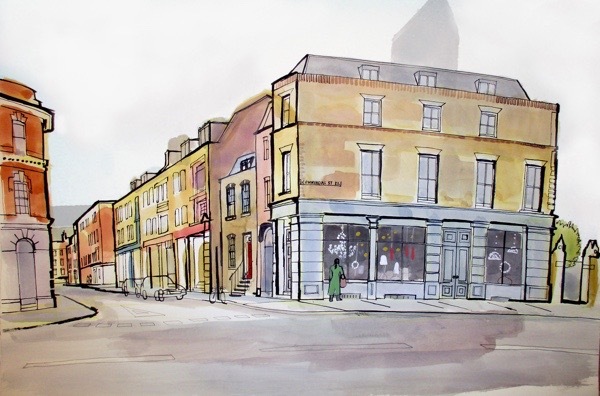 All within a Conservation Area, where the prevailing height is four storeys, and where heritage should be protected. 7. Norton Folgate is worth fighting for. It is a fine example of the lesser-known areas of historic London which make our capital city the wonderful place it is, but which will destroyed forever if this development goes ahead. 8. Please be sure to include your postal address otherwise your objection will be invalid. Over seven hundred people wrote to Tower Hamlets Council to object to the previous scheme but two hundred letters were discounted through lack of address. Why oh why can’t they just preserve the most they can? All of it…if you ask me. This is the whole problem…one by one, a building at a time, London is being dismantled. It has become more and more unrecognizable. How can you say you are proud of your heritage and city yet make decisions like these? I expect the legal challenge concerns just WHY the Mayor and not the Secretary of State is calling in the application. Directly elected Mayors are a problem – too much power and with too much conflict of interest which could compromise/skew judgment is my view. I’m appalled that Boris Johnson has any say whatsoever. mm if that’s the revised version I worry that they know something we don’t! I am planning to write my letter today as this whole situation is of national importance. London is our capital city and whilst Boris, or any future Mayor of London, has this amount of power and influence our whole way of life is under threat. I was horrified to read his record Does he not care about the legacy that he will leave? Presumably not. It looks as though it might take the combination of Tower Hamlets Strategic Development Committee, Spitalfields Trust, Troels Poulson, objectors like us and a judicial review to try and combat the whims of one individual. And still the cards are stacked in Johnson’s favour to do as he wishes. Some democracy! As I’ve said before, I’m afraid that this Mayor, and in general the whole concept of an individual Mayor rather than a Council, is there to further national government’s policies. This government is determined to take away whole swathes of local authority funding, telling them they must make up any shortfall by commercial means. Boris Johnson is saying that Tower Hamlets is not turning enough of its properties into commercial assets. He clearly thinks his bread is buttered by carrying out government policy rather than respecting either local authorities or the public if they have different ideas. It’s tragic that London’s history and character counts for so little. 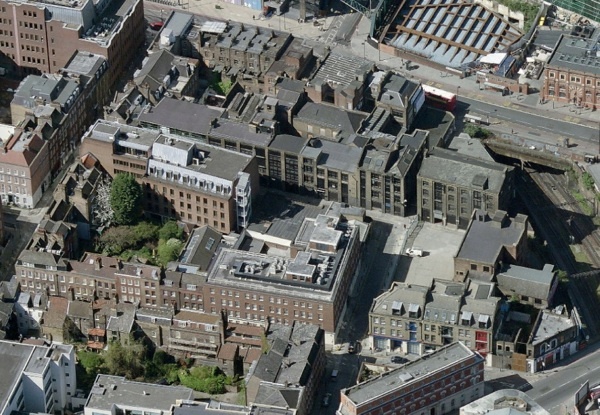 And it’s the pits that all the effort put in by the GA and those of us who wrote letters and came in person to support the gentler plans for Norton Folgate should be in danger of counting for nothing. Ah well, back to the barricades! I’ve just written my objection and my strong support for the sensitive plans put forward by Spitalfields Trust. Good luck to them and to all those who oppose irresponsible destruction merely for profit. Sadly Boris’ track record is not good on this type of thing. 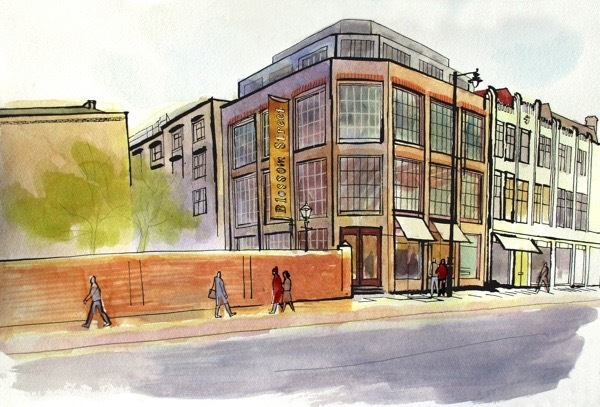 I fear that the sensitive and harmonious plans put forward by the Spitalfields Trust are unlikely to be accepted. It is not a level playing field and history and culture will be sacrificed in the name of big bucks and so called redevelopment. London is being decimated and is becoming unrecognisable in parts. Bland blocks of glass and concrete are shooting up everywhere. They without any soul or merit. It’s appalling, especially in an area as historic as this.